The goal of the Green Trail is to create a walkable path for campus and community to follow and learn about Marshall University’s many green initiatives, and how you too can Be Marshall Green. At “Green Stations” along the Green Trail, signs will display interactive information about each location, along with QR codes. Download our Green Trail Brochure PDF for a more self-guided experience. Geocache our Green Trail (GC63KFA)! 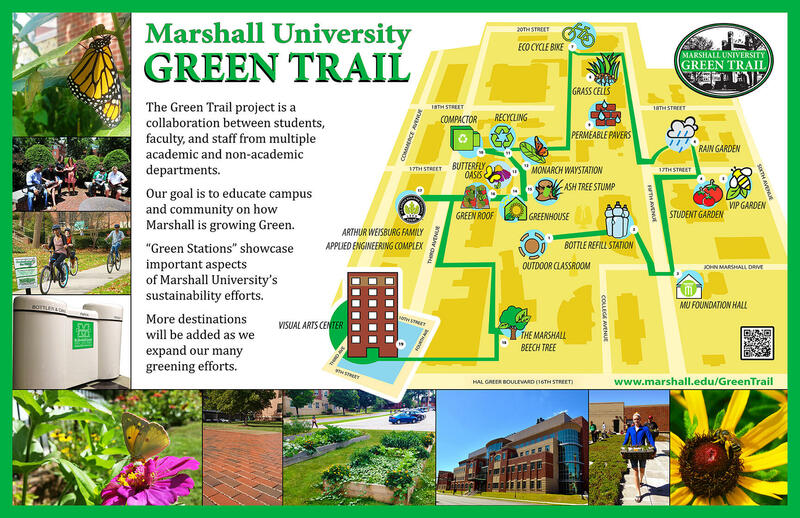 By following the trail, visitors will be able to easily tour our campus, learn how we are working to Be Marshall Green, and see how to live more sustainably. We host guided teaching tours of our Green Trail and use our “Green Stations” for hands-on learning with students and residents of all ages. Our Green Sustainability Education Modules (GSEM) curriculum development project also utilizes the Sustainability Gardens and other locations along the Green Trail. Through this education outreach, we hope to inspire all to embrace living a more sustainable lifestyle. We look forward to growing this site along with the trail, as we continue to expand our green initiatives on campus, and beyond. See the sights of the Green Trail online by visiting our Virtual Green Trail. New trail signs were installed in the Spring of 2016. These interactive signs use graphics and photos to passively educate, while also providing QR codes for further interactions. They were developed by the Sustainability Department with the assistance of students, committee members, University Communications, Printing Services, and the School of Art & Design. The Green Trail campus map graphic was developed in partnership with Printing Services. The Sustainability Department is a division of the Environmental Health and Safety Department.